Changing grasslands, Penticton, 1950s. Stephen Cannings. 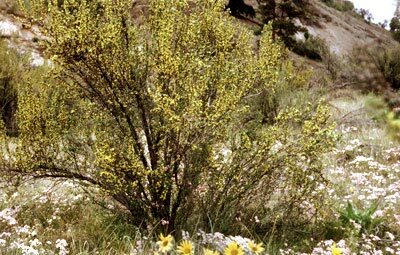 Many grassland plants and animals in British Columbia are southern species — rare in Canada — and many are threatened or have disappeared because of habitat loss or persecution by people. Grasslands covered with flowers in spring, Antelope-brush steppe, Vaseux Lake. Robert Cannings. Grasslands, with their rich soils and warm climate, are eagerly and easily modified by people for agriculture and housing. 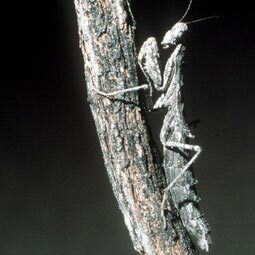 In Canada, the Ground Mantid is known only from the southern Okanagan Valley, where it is a rare inhabitant of a rare environment — sandy, shrubby grassland. It is Canada's only native mantid. 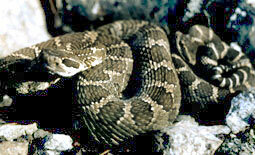 Populations of the Western Rattlesnake have declined because of loss of habitat and persecution by people. This shy, mostly nocturnal snake is poisonous, but seldom encountered. 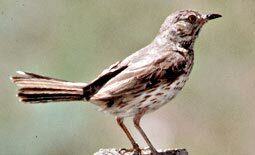 Only a few pairs of Sage Thrashers live in Canada, most in southern Okanagan and Similkameen valley grasslands containing old, large sagebrush plants where the birds nest.